The Platinum 90 subsink system contains Aquathin's uniqueproprietary process of Reverse Osmosis, Deionization, and Granular Activated Carbon and combines with with Aquathin's revolutionary Electronic Intelligent Memory Panel (EMP) for automatic maintenance. The benefit is prolonged efficiency by removing the necessity of manual flushing. 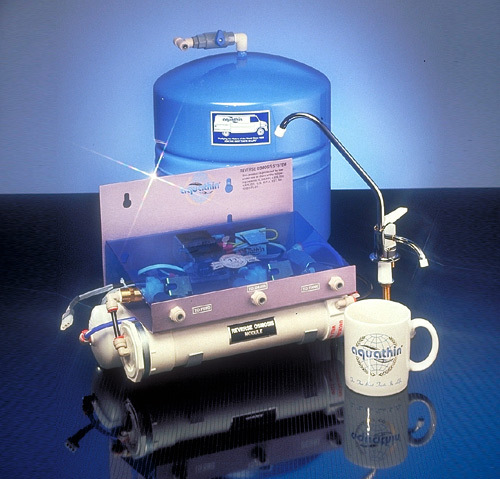 The Aquathin Platinum 90 Subsink unit is the most compact system on the market. It is easily installed and can be attached to your icemaker. The Aquathin RO-DI system produces "salt-free" water for daily use. This unit removes salt, heavy metals, chemical pollutants, pesticides, and disease causing water borne micro-organisms. Comes complete with revolutionary state of the art features surpassing any other water treatment devices. Please click the Product Catalog button below for more information on the Aquathin Platinum-90 System.